UFC lightweight Melvin Guillard (Pictured) might be built like Superman, but just like his comic book counterpart, his Lex Luthors have quickly discovered his kryptonite. Despite owning the explosive game required to compete with the sport’s elite, Guillard’s biggest weakness has been exposed for the entire universe to see and scrutinize. When you have 42 professional bouts under your belt, 10 defeats on your record isn’t that big of a deal. However, following his rear-naked choke loss to Jim Miller, nine of Guillard’s defeats have now come by way of submission. “I don’t regret anything I did [against Miller],” Guillard expressed at the post-fight press conference. “I think I went in and implemented my game. I fought one of the best guys in this division and I think I sent a message to a lot of guys. In his last outing in October, Joe Lauzon forced Guillard to submit to a RNC in merely 47 seconds. 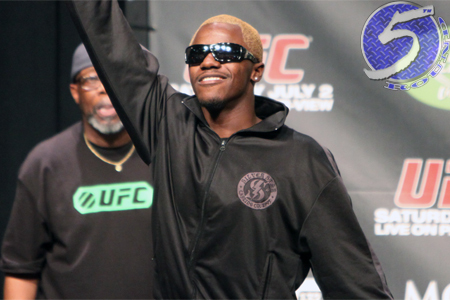 It was believed if Guillard would have been able to uphold his 4-to-1 favorite status, he would have been next in line for a shot at the throne. Despite his latest setback, “The Young Assassin” is still overflowing with confidence. “At the end of the day, Jim Miller and I both – you guys make sure you get this right – Jim Miller and I are the two best guys in this division,” the 28-year-old expressed. “Guys don’t want to fight us. Guys aren’t lining up to fight Jim and me. Okay, but you have posted two straight 1stRound losses in the UFC’s deepest division. So the clock is ticking.